Testimonials From My Amazing Couples! Firstly, we just want to say a MASSIVE thank you to Aretha for everything she did for us on our wedding day and leading up to! As a couple from Australia, we decided to have our dream wedding in New York City. Organising a wedding from overseas was not the easiest of things and when looking online for an officiant we found Aretha. We contacted Aretha via email and she responded Immediately, we booked in a FaceTime meeting and from then we knew that she was perfect for us and exactly who we wanted to officiate our wedding. Aretha would respond straight away to every single email/query we had, it didn't matter what time it was and even with us being in another time zone. She also helped us out with different aspects of our wedding with recommendations as we are not familiar with wedding vendors in NYC. She made sure she really got to know us and our history as a couple before the wedding day to ensure everything ran perfectly. Aretha made EVERYTHING so much easier for us with planning our overseas wedding. She was absolutely fantastic on the day with ALL of our guests even commenting on how amazing she was. We couldn't recommend her high enough. Aretha you made our day! Aretha Gaskin made our wedding ceremony unforgettable! Wedding planning can be the most stressful and scary task to undertake. Choosing the right vendors is crucial to having the perfect day. Some people will say the officiant isn't that important of an investment in the grand scheme of your wedding day, or that choosing an officiant can wait until later in the planning stages – that couldn't be further from the truth. Hiring Aretha as our officiant was worth every penny, and I wish we had booked from the first day we began planning. We contacted her through her website, to which she promptly responded and set up a telephone consultation. The conversation lasted over an hour because she was so personable. We hired her that same day. From that day forward Aretha was always available to answer any questions and offer guidance not only for the ceremony, but for the entire wedding process. We eventually added Aretha’s rehearsal services; it's a must do. Aretha is so professional and meticulous. She runs a tight ship so nothing will be out of place. She was able to point out things to our venue about setup and placement that would have definitely been overlooked. We asked for a very simple ceremony format. She delivered just that, and it was still unique and very classy. The vows she crafted for us were so beautiful and reflective of our personalities, as though we had written them ourselves, or she had known us for years. 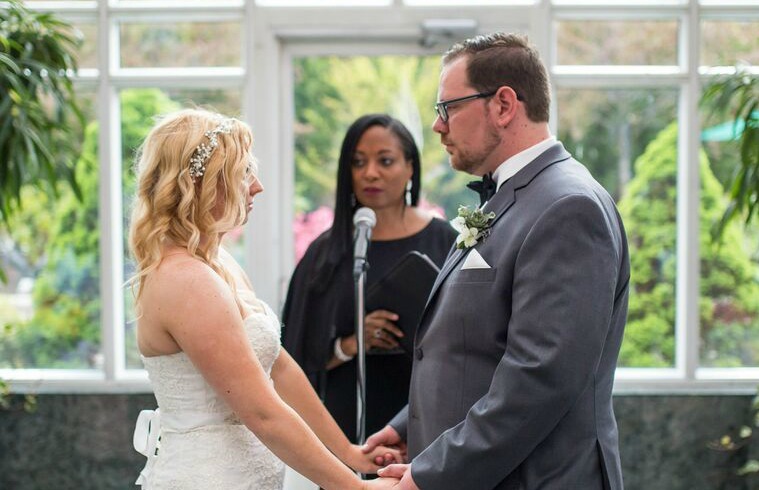 Our guests enjoyed our ceremony and raved about our vows and the sophistication of our nuptials. Aretha's process is amazingly thorough; we had only to follow her lead and our wedding ceremony was sheer perfection. Also taking her advice for the rest of the wedding helped to make the rest of the celebration as magical and memorable as the I do's! We are forever thankful to have found Aretha. She is professional, knowledgeable, and kind, but knows when to push the limits. Aretha pushed us to be more vulnerable and honest than we could have been without her. She is extremely organized and thoughtful. She does a beautiful job at analyzing what the couple's thoughts and ideas are and making suggestions for improvements, without being pushy. Above all else, Aretha was respectful of our beliefs and tailored the ceremony to our needs. She understood our views on spirituality and religion immediately and was able to write the ceremony around this. She was able to tell our love story to our friends and family in the most beautiful and respectful way. We are so thankful to Aretha and highly recommend her! We are so grateful to have found Aretha! From our first phone call, we knew we found a true professional. Aretha took her time to get to know us through several conference calls and surveys and crafted the most beautiful, sentimental and unique ceremony for us. We are still receiving compliments on our ceremony, it was all our guests were talking about at the cocktail hour. Working with Aretha was an absolute pleasure and we can’t thank her enough for being such an incredible part of our big day. Aretha officiated our wedding on 10/12/18. I wanted a wedding officiant who understood my vision and took careful time to get to know me. Aretha did that and so much more! She is simply amazing!!! Aretha is very professional, kind, and knowledgeable. She is also a woman of color and presents herself in a very dignified manner. It was important to me to have someone with experience working with other LGBTQI couples. Fortunately, Aretha has that experience and mentions it on her website! Aretha begins the process with a free consultation (which I thought was a great idea for anyone skeptical or lacking officiant knowledge). The consultation included a short interview on our love story and our ceremony vision. During this consultation, Aretha thoroughly explained her services and what made them unique from many other officiants. Aretha's work is very personalized and intimate. She spent time creating the ceremony of our dreams! Aretha's soothing presence helped to calm our nerves. Her guided instructions during the months prior helped to create such a flawless day. Everything was prepared; we did not have to worry about a thing! She even helped us compose our ceremony programs which we were incredibly thankful for. I truly cannot thank her enough, we still have our wedding guests complimenting our ceremony and sharing how thoughtful and personal each moment was. Thank you for everything Aretha! Wedding planning is not easy as most can imagine, whether you’re planning a 500+ guest, black-tie affair or an intimate gathering with a handful of family members and friends as ours was. I have to admit, this was a lot more than I bargained for but the only thing that gave me peace of mind on our special day was Aretha. She was everything we could ask for and more. She made the entire process so seamless, from the initial call when she spoke with me and my husband to get a sense of who we are as a couple, to follow up e-mails and calls to make sure that she catered the event to our specifications; our day couldn’t’ve been more perfect. Aretha even made suggestions on what additions we could make to the program to make the day inclusive for my mom who is of a different faith than I am and to honor my dad who wasn’t here to witness this day. Even on the day of, she coordinated with my Maid of Honor perfectly, ensuring that there would be nothing we would have to worry about on our wedding day. When we got to the alter, I couldn’t stop the tears and Aretha was very kind, reassuring me that I was still a beautiful bride despite me ruining my mascara before I even said my vows and that it was okay to be so emotional in front of our guests. What gave us some additional peace of mind was finding out that she was from our country; from then on, we approached our conversations with an air of lightheartedness, knowing that she would understand some of our more informal traditions. When planning a wedding, it is important to have someone who listens and provides guidance when necessary and Aretha did not disappoint. I am so happy we found her and I’m positive that she will also make your day truly memorable. Thank you Aretha! My husband and I cannot thank Aretha enough!!! She is AMAZING!!! She is so patient, attentive, well organized and a great advisor. She took her time to get to know us personally as a couple and separate individuals through our weekly phone conferences, daily emails, and questionnaire. We couldn't have asked for more than the performance and professionalism that we received from her. She knew we didn't want your typical traditional ceremony. And she exceeded both our expectations. Our wedding ceremony was just PERFECT!!! 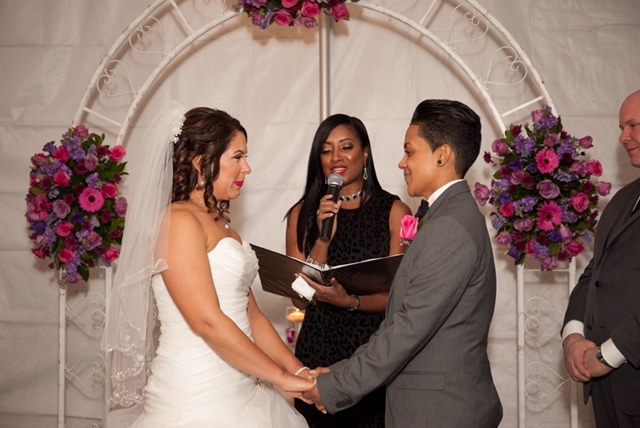 Aretha at first, was hired as our Officiant, through the midst of our planning, as we noticed she would go above and beyond the description of her job, and she was later on asked to take on the responsibility of being our Day Of Coordinator and thank God she accepted! She orchestrated our ceremony and reception so beautifully. I would refer her services time and time again. Thank you again Aretha!!! What can I say about Aretha other than the fact that she really is THE BEST! We were looking for an Officiant for about a year. Fakhree and I come from different religions, so we needed someone that was neutral. We discovered Aretha’s website and I loved everything about it. I thought in my mind that this lady is real and very professional. We read through the whole website. We even let our closest family members read through it as well. Then we saw that she was charging on the higher end. So, we looked at other pages of other Officiants. Somehow, we found ourselves going back to Aretha’s page. So, we finally sent her an email. She responds to every email in a timely manner. She is very professional. Our initial call was about an hour and half long. We enjoyed the conversation. She asked us very important questions that made us revisit why we were getting married. She really got to know us. After the call she sent us both multiple emails still trying to get to know us. She’s very detailed oriented. She is more than an Officiant – she is very caring and passionate about what she does. I feel like I have known her for years. Aretha also hosted our rehearsal which again she was very professional. She is all about perfection. She delivered the best ceremony ever! She told our love story which meant the world to both of us. Everyone keeps talking about her and the ceremony. She is definitely worth every cent plus more. My husband and I cannot thank Aretha enough! The vibe of our ceremony was love, laughter, smiles and happy tears and Aretha made everyone whom attended the ceremony feel the love and feel included regarding our ceremony. Aretha is a PHENOMENAL officiant and we are truly grateful to her. She kicked off our event and we were amazed. Our dream became a wonderful and magical reality! She is the best wedding officiant we have ever met. Aretha is a bride and grooms dream come true! She is truly PERFECTION! When me and my husband were looking for someone to officiate our wedding I happen to go on Instagram first and scanned her page and then found Aretha via her website. Her website is phenomenal and explains her services. I then proceeded to look for videos regarding our venue and she happened to be officiating a wedding at the same venue. I was floored, and I knew right at that moment I found our Officiant. I told my husband and he was like wow let’s reach out to her. I reached out to her via email and she responded to me within an hour and we had a conversation with her the same day. Our conversation within the same day made me realize her true professionalism. Our various conversations made us feel like we have known her for a lifetime. We built a relationship with Aretha for a year prior to our wedding and it was the best decision ever. Aretha walked us through the entire process and made us realize how much more we needed to be organized. Aretha is much more than simply an Officiant, she helped us with our timeline, had various phone conversations and help us tweak our day of details. The day of the wedding we knew she was going to absolutely stun our guests with her voice and delivery of our ceremony, but it was much more than we could have ever imagined. She delivered the most beautiful ceremony and we are still getting phone calls and text messages from our guests indicating they have never witnessed such a beautiful ceremony like the one we had EVER! She is truly a modern-day officiant whose words and delivery can cast a spell on the bride and groom and guests. She is AMAZING. I now see why she is so highly recommended. Aretha delivered our beautiful love story and we felt as if time stopped just for us. We are forever grateful to her! We had interviewed 5 different officiants for our wedding. All were approximately half of the price of Aretha. But its true what they say, “you get what you pay for”. Aretha was on a different level. She is very structured and has outstanding communication skills. Not only did she provide a great ceremony as our officiant, but she constantly reminded us of things that we may want to consider incorporating into the wedding planning the way a wedding planner would have. She is well worth the money. Thank you Aretha. When Brian and I first started planning our anniversary party the ceremony was the last thing we thought of. We knew we wanted to renew our vows but thought for sure that we could have a friend or parent “perform” the ceremony. Thank goodness we came to our senses. Upon speaking to Aretha, we very quickly learned how much work goes into performing a ceremony. The process in which Aretha got to know us was incredibly detailed and thoughtful. She really took the time to get to know us as a couple and individually. Our ceremony was a true representation of what we wanted to share with our family and friends. It wasn’t your typical, traditional ceremony and that was because Aretha made sure it was unique to our journey. Aretha is AMAZING at what she does, and although the night flew by.... I will never forget how I felt during our ceremony. Our guests were amazed at how personal the ceremony was to us and how Aretha shared our story in the most perfect way. What else can we say, except…PERFECTION. We couldn’t have asked for more in selecting Aretha to be our wedding officiant. She was kind, attentive, and most importantly original. My fiancé and I did not have a church home when we started planning our wedding, so trying to figure out who would officiate our wedding was probably the most difficult decision we had to make; until we met Aretha. Our first conversation with Aretha was about two hours long. We talked about EVERYTHING from how we met to her wedding day attire and order of the ceremony. By the end of the call, we both felt like we knew Aretha for years. There was no doubt that Aretha would be our officiant. Throughout the planning and leading up to the days before the wedding Aretha would check in with us to make sure we didn’t have any questions or concerns and that we were maintaining our sanity. The day of the wedding we had no idea what Aretha planned to say but we knew it would be great, but that too is an understatement. Her words were intuitive, modern, and classic. We could not have asked for nothing more. Our guests are still raving about our beautiful ceremony performed by Aretha and we couldn’t be more grateful. My wife and I were eloping at the last minute. We had 2 weeks before our out of state wedding ceremony and everything was rushed. At the time all we were thinking about was affordability because we were losing a deposit on our original venue. Which is why we called ourselves shopping around for the most affordable officiant. But I am so glad we did not take the cheap route! Aretha may have been double the price of other officiants but she is WORTH EVERY PENNY. Words cannot express how amazing and accommodating she was for our last minute arrangements. Not only was it last minute, our day was rained out as well. She pulled unbelievable strings to make sure our day was perfect no matter what. From our experience with her we've learned all of her reviews are extremely accurate. I highly recommend her to everyone! Aretha is the greatest! I'm not sure how we found Aretha, but we were so grateful when we did. The way she carries herself I assumed she was a celebrity. She's sophisticated and so elegant through her videos and pictures. After reviewing how she officiated other weddings, I felt that this is what we wanted too. It was like having a friend or a close friend of the family officiate your wedding. I'll be honest, Aretha's services may appear expensive. It is. You can easily find any officiant that will charge you $200-$400 and you're happy because you saved some money BUT trust me, after you go to Aretha's website and watch her videos, you will see that she is worth every penny. She's personable. I remember our first officiant didn't even ask how we met or the proposal. Aretha asked about that and more! Consulting with Aretha is like interviewing for your love biography. She asks you deep questions and seems to really care about creating a personalized story for your friends and family. She follows up and is helpful when needed. She is definitely worth every penny and so much more. Family and friends are still talking about the ceremony. If you're on the fence book her now. You won't regret it. I am so grateful for that day I found you on Google. I was so impressed by your website and your portfolio and all your reviews. I showed my husband and said we have to have her. We planned our wedding in such a short time, I was worried that you wouldn't be available. So you can imagine how I was overjoyed when you got back to me and had my date free. It was fate. Definitely meant to be. You are so amazing! We love that you personalized our ceremony to fit us perfectly. My cousin who was in my wedding and is getting married next July asked so many questions about you. She was impressed by your work. Not only did you maintain a high level of professionalism, you were also warm. We felt your passion and the love you have for what you do. It didn't feel like all business. We are so thankful, and we will definitely be calling you for our 5th year anniversary. Our wedding ceremony was absolutely beautiful and Aretha is a huge factor in bringing our vision to life. Aretha is incredibly professional and excels at her craft. She took the time to get to know us as a couple, as well as individuals, and used that background knowledge to craft a heartwarming ceremony for us. Aretha’s warm and kind hearted personality added a special touch to our ceremony. From the first conversation we had with Aretha, we just knew she had to be a part of our wedding. Aretha walked us through every step of the process and left no detail to chance. When it came to crafting our vows, she was incredibly supportive. What made working with Aretha such a pleasure for us, is that she is extremely organized and knowledgeable, she was truly able to capture the essence of our love and infuse it into our ceremony. We are eternally thankful to have worked with Aretha and recommend her with flying colors! Thanks to Aretha, our ceremony was everything we wanted and much more than we could have imagined. Everyone couldn't stop talking about how unique it was and unlike any other ceremony they have ever seen. I have to admit I was nervous about finding an Officiant online but after our first of many conversations I realized we were in good hands. We wanted an intimate, spiritual yet humorous ceremony that showed our personalities and how it all began. Aretha executed this to a 'T'. She was organized, responsive and was all about our love story – his version and mine. His version was better though. Aretha was also prepared for anything, from making sure we had a thorough rehearsal to not letting my dad's "marriage is an institution" joke interrupt her flow. At the end of the night we felt everyone knew why we tied the knot, they saw our relationship, our love story and how compatible we were all within 30 minutes. To top it off we received our Marriage Certificate the week we came back from our honeymoon! Thanks again Aretha for being great at what you do and giving us a beautiful ceremony to remember!!! Our search for an officiant started and ended with Aretha. From the moment we made an inquiry, she responded promptly. During our first conversation, she was informative about the ceremony process and marital license laws. She took the time to get to know us and hear our love story. She asked important questions about the type of ceremony we wanted. She gave us the opportunity to ask all the questions which she answered with professionalism and insight. Promptly, Aretha provided a ceremony template for us to tweak and adjust as needed during our wedding planning process. She was always available via email or phone to answer questions. As we got closer to our wedding date, Aretha was sure to communicate with us continuously. This eased our nerves so much. She came to our rehearsal which made not only us, but our family and friends more comfortable for the day of our wedding. On our wedding day, she arrived early and fabulously dressed--I must add. She fit right in to the attire of our wedding. Her personalized ceremony was heartfelt, detailed, sincere, and well written. During the reception, so many people complimented her and the ceremony. Many have said it was the most beautiful ceremony they've ever witnessed. Aretha is one of our favorite vendors. The ceremony is the reason behind everyone being gathered to celebrate the day. Aretha ensures that the reason is not forgotten or underwhelming. She truly is a gem. My new husband and I will recommend her services time and time again. Our wedding ceremony was fantastic and we can say we owe that to Aretha. My husband and I live in California but we wanted to have our wedding back east with all our family. We found Aretha Gaskin on The Knot. She had great reviews so we decided to contact her. We had a consultation and she was all that we were looking for. She made us feel at ease and assured us that even though we would not physically meet till the day before the wedding (being that we were 3,000 miles away) that our ceremony would be perfect and it was. From phone conferences and questionnaires, Aretha got to know us. She reminded us and pointed out things that we didn't even think about. By the day of the wedding we set all our worries aside. The ceremony was beautiful. She took into account our multiethnic backgrounds and the diversity of our audience and made no one feel left out or offended. She made it about us, our story, and our love. We had 200+ guests and EVERYONE loved it. She took her time and said all that was needed to be said. One of the many compliments that we received was that the ceremony was truly warm and intimate. Our friends and family kept asking if Aretha knew us personally for a long time because the ceremony felt that intimate and personal. Even our MC who has been doing weddings for decades was sincerely impressed with Aretha's delivery. We all were impressed and delighted. From planning to the ceremony Aretha was there for us. If you want to have an amazing heartfelt ceremony Aretha is your girl!! Thank you Aretha!! My husband and I planned our wedding in 6 short months and quickly choose Aretha as our Officiant; her reviews were great and her energy was very apparent. Aretha is organized, punctual and detailed oriented. She was sure to check in with us as time passed to ensure that everything was on track. During the beginning stages, we each completed an online questionnaire that included providing information about ourselves, our relationship and our families. We never expected to have such a beautiful, beautiful ceremony created from such simple questions. When I say there was NO DRY EYE in the house, I am not exaggerating. Our ceremony and vows were customized to our relationship, our feelings and everything in between. We loved the beautiful Hand Ceremony that Aretha included; it was very emotional and sweet hearing it for the first time. Aretha was on time, very helpful, funny and patient during the rehearsal dinner. As the ceremony started, tears started to shed (from me) but Aretha came right over to me to ask if I was okay and gave a few short words of sweet encouragement. Aretha looked amazing too! Our marriage license was filed quickly and Aretha took care of the administrative portion while we enjoyed our honeymoon in Puerto Rico! Many of our guests asked how we found Aretha and said that they loved how involved and alive the ceremony was – one of our close friends said Aretha was "phenomenal". We have to agree too! We will highly recommend Aretha to others. While searching for an officiant for our wedding our goal was to find someone that was professional and someone who could produce an elegant ceremony. We were very impressed by our initial telephone consultation with Aretha and she put us at ease. During the ceremony Aretha was very personable and confident in her delivery. She provided great energy and made our guests feel comfortable. She created a ceremony that was unique to us. Many of our guest inquired about her services and our relationship to her. They were surprised to know that we had only known Aretha for a short time. We highly recommend her services. Aretha did such an AMAZING job on our ceremony! She had 140 people crying with our personal vows. We did a Wine Box Ritual, this is not well known to many couples, however she incorporated this ritual seamlessly into our ceremony. We also wanted our 3 younger children to say a poem, she helped them orchestrate the whole thing!! Not to mention how professional and personable she is or the fact that she was my guide, my shoulder, and never let me settle for anything less then what I wanted my dream ceremony to be. Our wedding was PERFECT because of her!!! I would not only recommend her....I'm telling you, if you want a PERFECT ceremony with your PERSONAL touch, she will and can make it happen. My husband was floored by her work. Thank you Aretha! Aretha made our wedding the most beautiful day ever. The process from beginning to end was smooth and stress free. Aretha exceeded our expectations by far. Aretha helped make our ceremony unique and special. She even helped us write our vows, which I never heard of a officiant doing. She takes on responsibilities that she doesn’t have to make your day perfect. My husband and I were blind to the whole process and Aretha helped put us at ease from taking care of the marriage license to the readings at the ceremony. When we met Aretha during rehearsal she was on time, professional and ready to make our ceremony the best she could. We felt like we have known Aretha for years because of how welcoming she is and her wonderful personality. Our ceremony was tailored to our love story and described us perfectly. Aretha is more than a officiant she helped us in many other ways other than the ceremony. Aretha gave the prayer at our reception after a family member who was suppose to do it didn’t show up. She is a lifesaver and we will always remember what she did for us. Thank you Aretha for everything you done for us we will never forget it. If you are looking for the best we would recommend Aretha’s services hand down!!!! We can't even begin to explain how amazing and special Aretha made our wedding ceremony. We're soooo happy we found her and she was able to officiate our wedding. Throughout the entire wedding planning process she was there and available to answer any and all questions, this really helped to alleviate the pressure of trying to plan the perfect wedding. She was extremely helpful and responsive to answering emails and phone calls. I was amazingly surprised at how she was ALWAYS available for us. Everything was perfect, the words she chose to use to emphasize our love still has me swooning until this day! We couldn't have chosen a better person to be a part of our special day. Literally people are still asking me about my wedding ceremony and telling me how beautiful it was. The last thing we wanted for our wedding was a generic Celebrant. We met Aretha and she was the exact opposite of generic. She was sincere, humorous and inspirational. Thanks to her professional advice and knowledge, our ceremony came to life. It was beautiful, meaningful and will live on in our memories of our special day forever. Throughout the planning process up to the day of, Aretha was prepared and on point. She was always available to us, answering any questions or calming any worries we had. Even after our wedding, Aretha has monitored and checked in with us to make sure we have received our Certified Marriage Certificate in a timely fashion. We are beyond pleased with Aretha's services. We are so glad we found her and even more glad that we chose her. Thank you so much Aretha for your dedication and hard work! With Aretha as our officiant we had an amazing and truly special ceremony. Aretha was there for us all through the planning process, and made us feel comfortable and ready for our wedding day. Her voice was truly captivating, and many of our guests complimented her style and said it was a beautiful ceremony. We were really happy with everything Aretha did, and couldn't ask for a better experience. 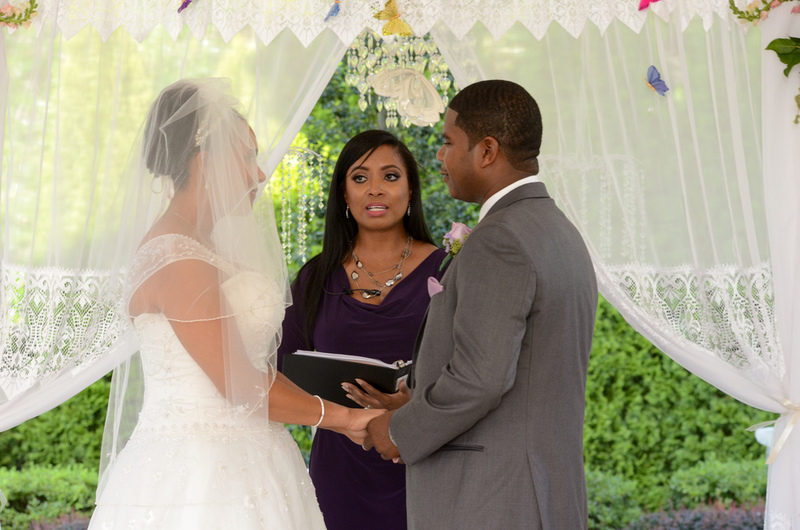 Aretha is a wonderful Officiant and she made our wedding day so special and unforgettable. Our ceremony was perfectly worded and hit every emotion, so much so she had us and others in tears. The words she chose to orchestrate our bond, journey, and overall love was breathtaking. It was exactly what we wanted. She was very thorough in finding out exactly what we wanted and tailoring it to our ceremony. I would certainly recommend Aretha if you are looking for an Officiant who is very professional and truly cares about making your wedding day special. We are so glad we asked Aretha to officiate our wedding. We knew we wanted a ceremony that captured our values, conveyed our love for each other, and shared a bit of our sense of humor. Aretha made it happen. We were so pleased with the tone of our wedding... lighthearted yet polished. Our guests were also very impressed. During the reception, we received many compliments on the ceremony. A week after our wedding, one of our guests stated, "I think you had the best Celebrant I've ever witnessed." We are so thankful to Aretha for agreeing to be a part of our special day. We thank her for guiding us through the pre and post wedding procedures, taking the time to learn about us as individuals and as a couple, and creating a truly memorable wedding ceremony that touched our hearts and those of our guests. Working with Aretha was great from the very start. Early in our engagement we decided we wanted a beautifully crafted ceremony that focused on love. We were vocal in not wanting our ceremony to focus on our love story or how we met but rather we wanted a ceremony to inspire our loved ones to feel love, be in love, and learn to love. Aretha listened intently to our wants and was able to create just the ceremony we dreamed of. Aretha was also hands down the most responsive out of all of our vendors. She was always helpful and replied to any communications in less than 24 hours. I never had to wait long for an answer to a question, and she always provided me with a clear response that never left me feeling confused or as if my question wasn’t fully answered. Her professionalism and her desire to create and grow her personal brand is unparalleled and we are glad we had the opportunity to work with her and that she was able to officiate the wedding of our dreams. We would definitely recommend her. We are so happy that we chose Aretha as our officiant. Thanks to Aretha, our wedding ceremony was absolutely amazing. She incorporated all of our various requests into the ceremony, and gave us the ceremony that we had always dreamed of having. During our wedding reception, our friends and family members did not stop raving about how great of a job Aretha did. From the minute we met her, Aretha put us at ease and calmed our nerves for what was the biggest day of our lives. She took a lot of time in getting to know us and was extremely helpful at every step of the wedding process. Her vast knowledge was evident and her preparedness for the ceremony was greatly appreciated. We would highly recommend Aretha to anyone who was looking for an officiant for their wedding! Thank you so much for officiating our wedding ceremony for us. It was a truly beautiful day we will remember forever!! We are so glad we found you, your services couldn’t have been more perfect. You really took the time to get to know us and by I the time our big day arrived, it felt like you were an old friend telling our story. Everyone kept commenting how it was the nicest ceremony they had ever attended. Thank you for all your attention to detail and professionalism! We will recommend you to everyone!!! Aretha was helpful with how we wanted our ceremony and explaining the different rituals. We ended with a short and extremely sweet ceremony. Our guests loved her energy and how charismatic she was. She helped us choose the location and had many helpful recommendations. 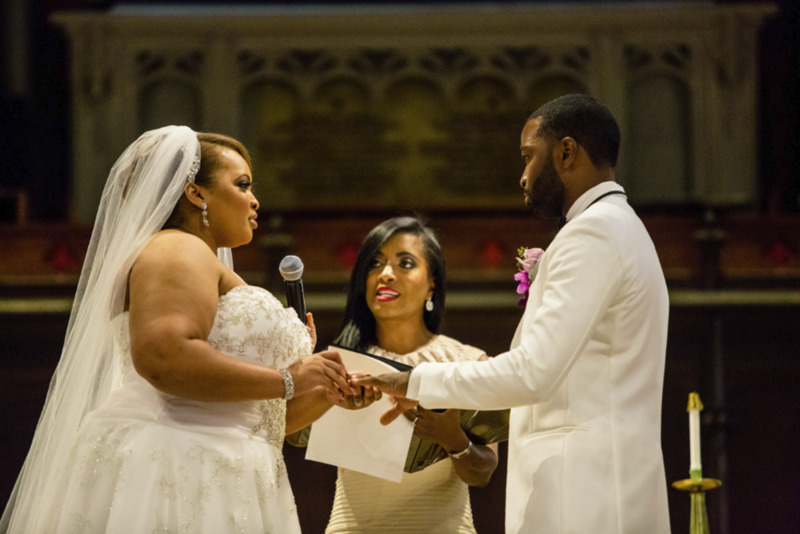 We recommend Aretha Gaskin to anyone who is looking for a Wedding Officiant. Steve and I thank her again for making our wedding ceremony memorable and beautiful. Aretha was fantastic throughout the WHOLE process! We wanted something small and personal and we were so moved by the ceremony she crafted for us. From the very start of this whole process (which we began a bit last minute), Aretha was great to work with. She was extremely responsive when it came to answering emails and questions, (which was not the case with other vendors), and when my husband and I decided last minute to change the ceremony venue due to inclement weather, Aretha was gracious and went with the flow. We will always remember Aretha not only for the beautiful ceremony she performed for us, but for the critical part she played in the most important and wonderful day of our lives. Her recommendations and patient guidance allowed for us to be calm and focus on the moment we were about to share with each other. Thanks again, Aretha! Thanks to Aretha, our wedding ceremony was truly special - totally tailored to describe our love story and fit our personalities. She really took the time to get to know us and our relationship, and it clearly showed throughout the ceremony. She was a pleasure to work with and put up with countless changes/requests we made in the weeks leading up to the big day. What's more, on the day of, the microphone the venue provided for the ceremony wasn't great - the audio cut in and out many times during the ceremony, but Aretha remained poised and maintained her warm tone throughout. In addition, we were interrupted by a blaring boat horn and Aretha played it off and we all shared a laugh. That is who you want officiating your wedding - someone who knows how to keep their cool and turn curve-balls into memorable moments. She is a true professional and hiring her was one of the best decisions we made. Thank you Aretha!!! Aretha, words cannot express how grateful Richard and I are to have had you officiate our wedding! Your attention to detail, especially that of our love story was impeccable. It is clear that you take the required time needed to study, understand, and develop a relationship with your clients so that their love story; in this case ours, can be conveyed to the guests in a very touching manner. Our ceremony was exactly what we wanted, intimate, honest, and about family! Again, thank you for making our special day incredible, you will forever be a part of our loving union. Aretha, my new wife and I would like to take this time and say thank you for all you have done toward guiding us and officiating a ceremony that many continue to talk about to this day. July 8, 2016 is a time we will never forget. While unforgettable, we would like for you to know that you played an intricate part in making it such a memorable occasion. We recognize that officiating a wedding ceremony is what you do, but, we believe you did a job that was beyond expectations. The process proved that guidance was a necessity because we had minimal knowledge of the marriage license process, the details and importance of the wedding ceremony and the organization required to facilitating the union of Bride and Groom; for all you have contributed to making the process a smooth transition, allow us to say we are grateful and very appreciative. At the end of the night, three couples asked for your information to have you officiate their wedding ceremony within the next year. Once again, thank you and God Bless!! Having Aretha officiate our wedding was an absolute blessing. Shemeka and I were more than impressed by what Aretha was able to put together for us. Our initial search for an Officiant was dreadful as the options we were given were sub-par. By chance we came across Aretha and instantly we were blown away by her level of professionalism and attention to detail. We were particularly impressed with how she structured the ceremony and how she incorporated our love story. We cannot express how truly grateful we are to have had Aretha play such a vital role in our most special moment. If you are seeking that special touch for your wedding, then Weddings by Aretha is the only way to go! Hiring Aretha to officiate our wedding ceremony was one of the best decisions we made. We can’t say enough great things about her! She always exemplified professionalism during the entire process and truly became a welcomed partner. From our initial discussion, we felt very comfortable talking with Aretha and her expertise eliminated any anxiety. Therefore, we quickly hired her. Her process to get to know us as a couple and as individuals was extremely thorough, organized and well thought out. As a result, our ceremony was authentic and perfectly customized to our love story as a couple; it was truly magical. During the planning process and at the ceremony rehearsal, she went above and beyond to ensure our ceremony ran smoothly by working with us to cover off on every detail that can easily get missed. Even after the ceremony she stayed engaged by making sure we received our marriage certificate. Aretha demonstrated that she is more than an officiant; she cares about the couple’s happiness and takes a personal stake in the ceremony’s overall success. If you’re looking for a partner and a sincere person in addition to a perfect ceremony, look no further than Aretha Gaskin! My husband and I were amazed by the ceremony we received from Aretha. Not only did we think it was PERFECT but our guests have told us that our ceremony was the most romantic and intimate ceremony they have ever been a part of. Aretha was very thorough and responsive during the planning process and was such a calming and wonderful presence at our wedding. She is a great speaker and we felt like she was family. Our ceremony was heartfelt, beautiful and unique and we are so glad we went with Aretha. If you are thinking of using her to officiate your wedding, DO IT. You will not regret it! Eric and I would like to say a huge thanks to Aretha for officiating our ceremony. Our ceremony was everything we dreamed of. Even though it began to rain on us Aretha continued to speak beautiful words about us and our love. Our guests continue to speak about how unique our ceremony was. I was extremely nervous about finding an Officiant online but after our first conversation I knew we had found the perfect person to perform our ceremony. It was traditional yet unique, she incorporated a beautiful prayer, hand ritual, and our love story and still kept things moving smoothly. Aretha executed exactly what we were hoping for, she was very organized, even though our directions to her weren't always accurate. She encouraged us throughout the vow writing process, as I was so nervous, but she reassured us that as long as it came from the heart it would be perfect. Once again we would just like to say a heartfelt thank you again to Aretha for giving us a beautiful ceremony to remember!!! Lucell and I want to thank you for a wonderful job planning and preparing our beautiful wedding ceremony. Thanks to your efficiency, everything was on point. Your positive spirit throughout the day set the tone which carried throughout the day. You were patient and professional and we love you for that! You remained unfailingly positive despite our running late, nothing seemed to be too much trouble at any stage along our wedding journey. You really helped us pull together the most special day of our lives. Our day was exactly what we wanted and more – simple, elegant, intimate and stress-free, all in the comfort of our backyard. And it was all possible thanks to your hard work. All the supplies/vendors you recommended were first class and we could not have done it without you. Lucell and I are appreciative and wouldn't hesitate to recommend your services. Thanks Aretha! My wife and I searched for a wedding officiant for months but we kept running into issues. We would get denied by some people simply because we didn't share the same religion. Others simply denied us saying the date didn't fit their schedules. And some denied us without sharing any reasons why. Then by the grace of God we stumbled across Aretha's website and decided to schedule a conference call. From the very first call until the date of the ceremony, Aretha was there for me and my wife each step of the way, answering all of our questions in detail. Also making us feel comfortable with asking any questions or concerns pertaining the ceremony. Aretha also held a rehearsal so that we felt even more comfortable for our big day. Any suggestion we had to include or exclude for the wedding ceremony Aretha met. Aretha made the process of getting married so much easier and comfortable than we've ever felt prior to meeting with her. All I can say is the vision, dream and plans that me and my wife had in our heads for this ceremony was brought to fruition and we owe that to Aretha! We highly recommend using her as your wedding officiant. We used Aretha to officiate our wedding and couldn't be happier about that decision. Aretha was more than a pleasure to work with. Our ceremony was custom tailored to our personalities and it was as if she knew us our whole lives. Everything we asked for she delivered. She went above and beyond her call of duty and we’ll be forever grateful for her services. She created a ceremony we'll never forget! Thank you Aretha! We’ll be recommending you to all our friends and family! We were so incredibly happy choosing Aretha to Officiate and would recommend her time and time again. She tailored our ceremony to suit our personalities, gave us her insightful input and added true value to our wedding day. She had written our vows and suggested we wait until the ceremony to hear them, as a surprise. We loved this idea, it was very us, and made them very special. That’s how much trust we put into her, because that’s how good she is at her job. We relied on email through all our communication and she was so quick to respond with all our queries and ideas. Having the opportunity to call her several times before the Big Day meant it kept us on track and made all our wedding planning stress free. She has even taken responsibility of receiving our Marriage Certificate and fed-ex’ing it back to our Home in the UK so we know it will arrive safe and sound. The entire experience was friendly yet professional, and Aretha herself is calming and encouraging. Thank you Thank you Thank you. My husband and I are so pleased with the way our ceremony turned out and Aretha played one of the biggest parts in making it so perfect! From the very first conversation we knew she was going to be our choice of officiant, she was able to listen to our wants and create a ceremony that was young and modern but also romantic. Although we were a bit late in the planning process Aretha was able to quickly schedule time to speak with us, making sure to work within our schedules and have a quick turnaround for readings and options to choose from for our big day. When our day arrived Aretha was very professional, on time, and looked just as amazing as any of our guests which is very important for all of the pictures being taken at the ceremony. Even though we threw a few curve balls during the ceremony at her she was able to adapt and keep her composure in order to give us the best ceremony we could ask for. 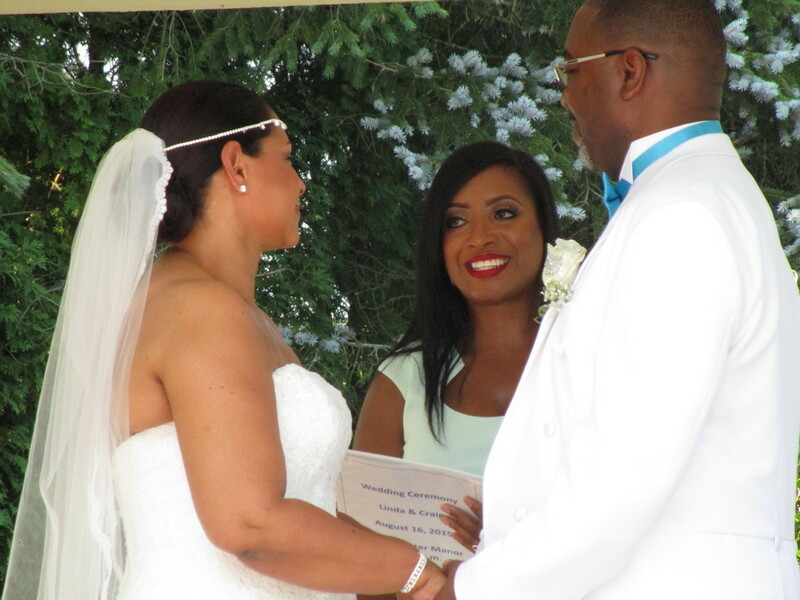 We will definitely be recommending Aretha Gaskin to all friends and family looking for an officiant in the future. From the first moment Jennifer and I spoke to Aretha, we knew she was the right person to officiate our wedding. She was warm and caring and helped us create an experience that will live on in our hearts for the rest of our lives. The ceremony was heartfelt and one of a kind. Jennifer and I appreciate the time Aretha took to get to know us and create a ceremony that was tailored to our journey and honored my deceased grandmother. We couldn’t have asked for a better person than Aretha to help us celebrate such a joyous occasion with our family and friends. We would definitely recommend Aretha to all our friends and family or to anyone looking for a top notch wedding officiant. Jennifer and I, as well as our family cannot say enough great things about the ceremony we had. Aretha is always available and gives superior service. I would like to thank Aretha on behalf of myself, Lisa and the friends and family that attended our wedding vow renewal ceremony. First off the location a hidden gem in Central Park was stunning! The service, Aretha got it to a tee and took on board the information about Lisa and I was perfect. Everything worked out so well I even think Aretha organised for it to be a sunny day it was that good! Our friends and family were just blown away by the whole experience, which made it more enjoyable for Lisa and myself. So once again, thank you for your services and I would certainly recommend you to anybody looking to do the same as we did. Especially if you’re traveling from another country as we traveled from Dublin Rep Of Ireland. Aretha made everything perfect for us. Gerard and I are extremely happy with our choice to hire Aretha to officiate our wedding. She is remarkably professional and well organized. Aretha followed through with emails in a timely manner no matter what time we sent them. She was able to tailor the wedding ceremony to fit our personalities without having met us and even helped Gerard surprise me with custom written vows. When we had to make a last minute change to the order of the ceremony, Aretha was flexible and seamlessly carried out the ceremony without a hitch. She sent our paperwork right away and I didn’t have to worry about a thing. Working with Aretha was the easiest part of planning our wedding. It was a stress free and enjoyable process. I would recommend Aretha’s services to anyone looking for an extraordinary officiant for their wedding ceremony. Aretha Gaskin was a perfect fit to officiate our wedding. She was a pleasure to work with. She has a wonderful speaking voice and she really tailored our wedding to fit what we wanted. She was easy to work with and really went above and beyond in keeping us organized, stress-free, and ensuring that the ceremony would be beautiful. Which it was so very beautiful!!!!! Our guests raved about what an amazing job she did and how she personalized the whole ceremony, including the acknowledgements and memorial candle lighting for close family members recently lost. We highly recommend Aretha to anyone who is looking for a wedding officiant. Thanks again for your assistance/participation in making our wedding day so memorable. My husband and I hired Aretha as our officiant for our wedding. She did an amazing job! There couldn't have been an even better match. She made our ceremony so unique and personal. It was like she knew us for years. She is a true professional. I feel like she went above and beyond her job. She made sure our rehearsal went smoothly (and it did, I had a very large bridal party). Aretha made our day perfect in every way. If you need help writing your vows she will assist with making them perfect for you and she will even have a copy of you vows ready for you on the day of your wedding. Everyone is still telling us how wonderful our ceremony was and I thank Aretha for that. She is outstanding. I would 100% recommend her, please don't even bother looking any further. Aretha made our day absolutely perfect! We planned a rather last-minute elopement to the Jersey shore and Aretha helped us put together a beautiful, romantic ceremony that truly reflected our personalities. When we were having trouble writing our vows, Aretha guided us to find the most meaningful and eloquent words to capture the exact feeling we wanted for our ceremony. During the planning process, Aretha was attentive to every detail, making sure nothing was overlooked, and spent quite a bit of time on the phone with me to go over each part of the ceremony. When the day came, her kindness and professionalism put us both at ease and made the day truly enjoyable! I would definitely recommend Aretha to friends and family, whether they’d like a traditional ceremony, or a more unconventional one like ours. Our witnesses were so pleased with the ceremony, that they even asked for Aretha’s information to pass it along to friends. We can’t thank her enough for making our day so special! From our first email, Aretha was warm, inviting, professional and so friendly. She was there to talk through all of our concerns, questions, and everything we had in mind for our special day. We had envisioned something intimate because of the very small size of our wedding, and something that expressed both of our feelings for each other. Aretha blew us away with her ceremony! She created the most incredible vows that reflected ourselves and our love for each other, and truly made our wedding an incredible experience. We were amazed at how perfectly she captured the spirit of our relationship, and how eloquently she translated it into words. We can’t say enough how thankful we are!! Our wedding would not have been the same without your dedication, talent, and heart. Thanks Aretha!! Aretha was very professional to work with. In the months prior to our wedding, she made herself available to assist us with the planning and format of our ceremony and this was a tremendous help! Her efforts ensured that our ceremony went smoothly and she even coordinated her dress to match the wedding colors. We highly recommend her services as she was pleasant, professional, and incredibly helpful!! I would definitely recommend Aretha Gaskin to Officiate your wedding. From the consultation process to the ceremony she was professional at all times. She really spent time getting acquainted with me and my husband and this was reflected during the ceremony. I was thoroughly pleased and amazed at the wonderful words spoken during the ceremony where our parents were honored. Once the ceremony was complete she ensured that all the pertinent parties had signed the license and immediately submitted the license to the respective county for processing. Our guests provided great feedback and were pleased that she had officiated our wedding. Again our ceremony went just as planned! With our last minute wedding plans, we didn't know if we would be able to find someone in time. Aretha was the first person I called and I couldn’t be happier that I did! She did an amazing job giving us a beautiful ceremony. From her heartfelt introduction to the customized vows she prepared for us – I was truly touched, and it made our ceremony very special. Aretha listened to our wants and needs and was extremely accommodating and flexible with our schedule and was a professional all the way. I would highly recommend her to any couple ready to make a touching and beautiful ceremony happen! She is a great officiant and we will be hiring her again in two years!! We absolutely loved working with Aretha. We decided that we wanted a private ceremony for the two of us before going off and planning a larger wedding ceremony with family and friends. Aretha listened to what we wanted but still made sure that this day was just as special, leaving us with beautiful words and the feel of a traditional wedding. Aretha far exceeded our expectations, she was very responsive answering all our questions and concerns and provided suggestions on places to do the ceremony, all with very short notice. Because of Aretha we ended up having a intimate ceremony in the park on a beautiful day and it could not have been any better. Aretha also made sure we had photos taken before, during and after the ceremony. I would definitely recommend working with Aretha if you want an officiant that cares about making your day special and memorable. First and foremost I would like to say THANK YOU for everything that you have done for us. All the effort you put into making our wedding the best day of our lives (besides the birth of our girls), we greatly appreciate. It was a pleasure working with you. The questions we had to fill out made us reflect on the WHYS of our union. It made us both feel the warm and fuzzy we always feel between us, but sometimes get pushed to the side because of daily life. The conversation we had on the phone made us more overjoyed that we had chosen the right Officiant for us. Aretha was so very pleasant to work with – speaking with her on the phone was like catching up with an old girlfriend. The comfort level was definitely there. Aretha also custom made our vows, which for those who either don’t have the time or just aren’t great with words helped a ton. Our ceremony was beautiful, very personal. I felt so connected to my Husband and Aretha set the stage for that. I felt like it was only him and I there with Aretha narrating our love story. Aretha also dedicated a part of the ceremony to my Mom, whom was there – she looked into her eyes and told her exactly how much she meant to me. I would absolutely recommend her services to friends and family, even complete strangers! She made us feel so special. Aretha was the perfect choice for us. I almost feel as though "officiant" isn't the most accurate title for a person like her. She became so much more than just our officiant. She was our friend, and the #1 wedding expert. I never imagined that I would end up developing a lifelong friendship with our wedding officiant. She helped us in more ways than we ever thought possible. She was able to create the perfect ceremony for us. Our entire ceremony was magical and filled with love. She made our guests feel included and the entire flow of the ceremony felt effortless and natural. At our reception, our guest were gushing about how heartfelt and beautiful our ceremony was. A guest even told us that if she were ever to get remarried, she would want Aretha to officiate her wedding. She is a real blessing to our relationship and I am so happy we chose her as our wedding officiant. 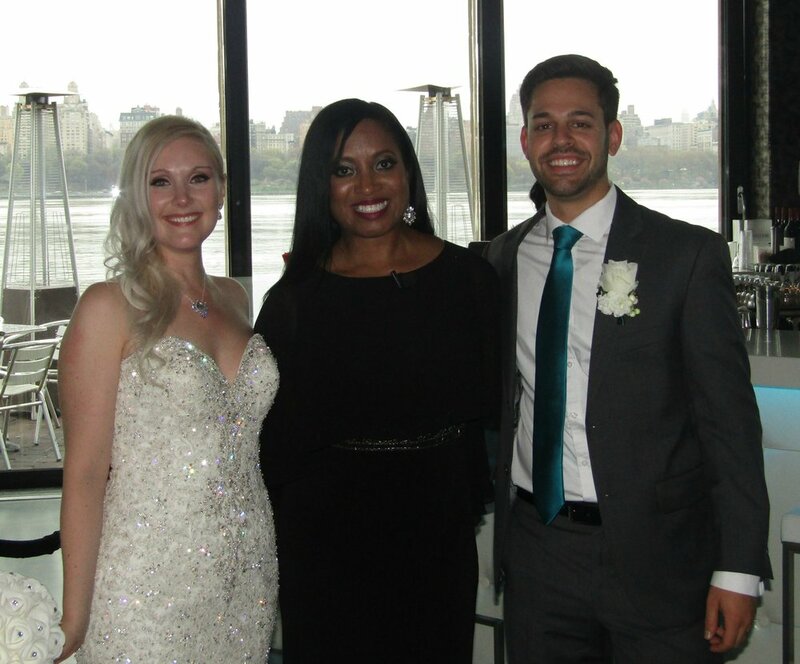 My now husband and I had the pleasure of meeting Aretha in New York City in early November and she was so kind and generous with us that when we found out she is an Officiant, we knew immediately we wanted her to officiate our ceremony. How lucky were we to run into this gem! 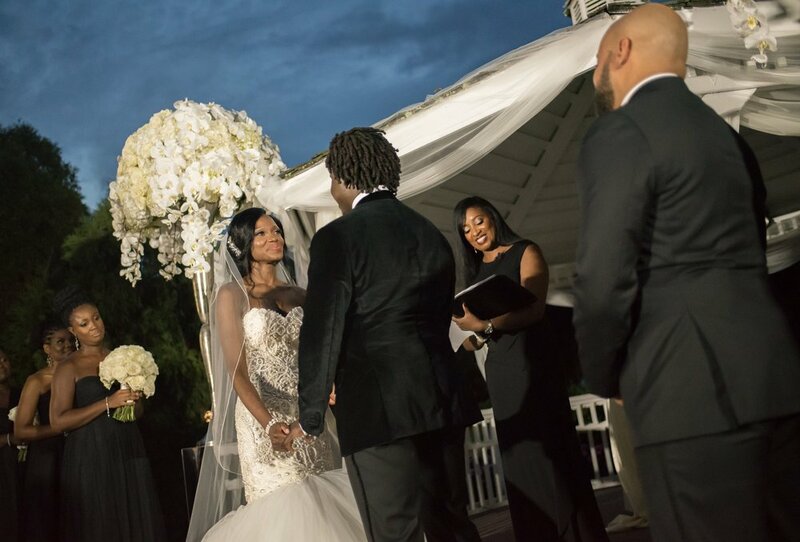 Aretha custom designed a ceremony that was SO US! We loved it! We couldn’t have asked for a more perfect ceremony or a more perfect Officiant. Our schedules are very hectic and Aretha was flexible and extremely accommodating – some of our conference calls were after 8:00 p.m. and she always responded promptly to emails and questions. On our wedding day she arrived 45 minutes EARLY and as is her style, she was gracious and on top of things. 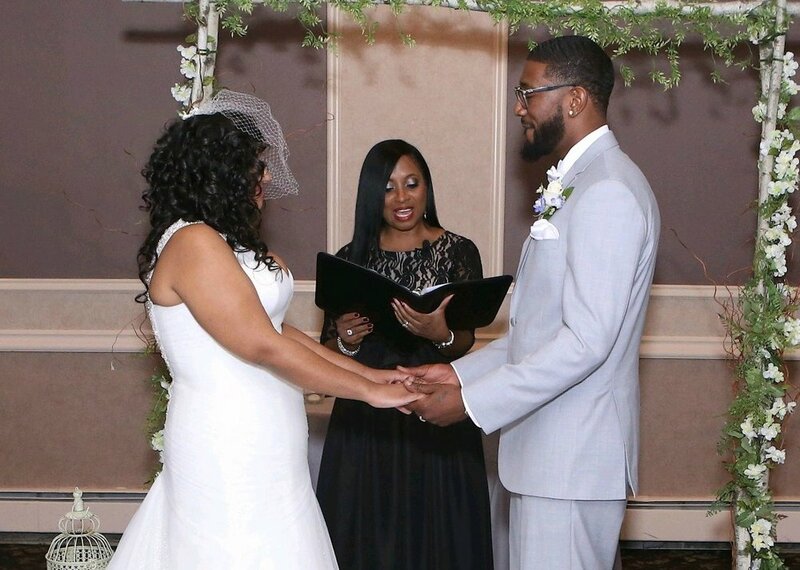 If you’re looking for an awesome Officiant who is dedicated and professional, look no further – we highly recommend Aretha! Thanks Aretha for a beautiful ceremony and for giving us a lasting memory of your kindness and generosity.